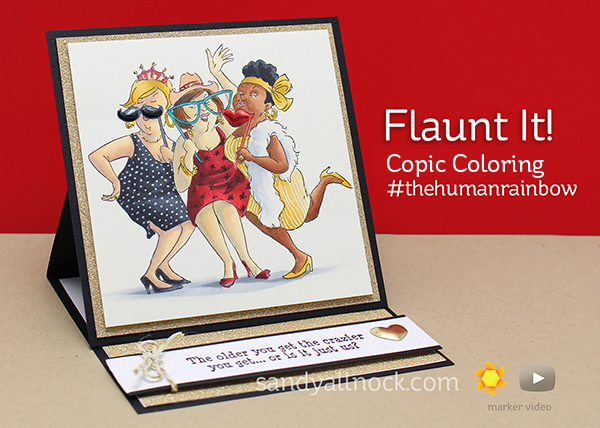 Coloring skin with Copic Markers: Flaunt It! For an exercise like#thehumanrainbow, this stamp is PERFECT. As are a lot of the Art Impressions people stamps! They’re drawn in such a way that you can really make ANY of them ANY ethnicity. 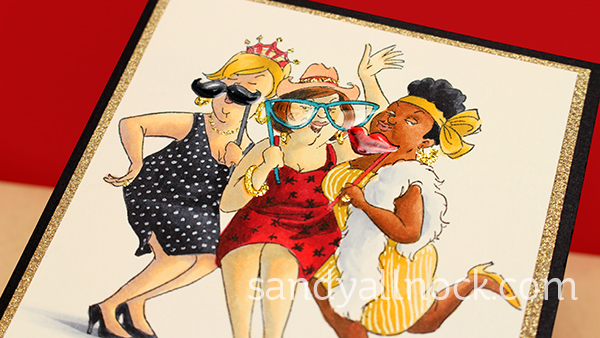 Just fluff up some hair or emphasize one feature or another, and you’ve got YOU and your mixed group of lady friends on a card! Check out the video then come back here for some free downloads, ok? Watch the video below or click HERE to see it in HD on YouTube. Are you ready for a bunch of freebies? Let’s do it, girlfriends! 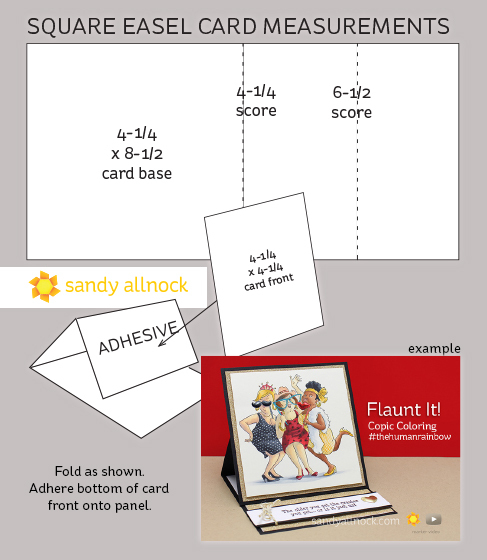 I worked out the measurements for the square easel card….you’re welcome! For CHA this year, I demo’d this stamp coloring, and provided a PDF to the customers who came by to visit. And guess what? YOU get the free pdf too! Download HERE. Oh my heck yes! Go ahead and download them HERE. In the PDF, there are hyperlinks if you want to go see what the image looks like before it’s scribbled on! If you’d like to purchase one and they’re out (a few were out last night when I checked!) then just sign up for notifications. For most companies, when you sign up it helps them know what the demand is so they know how many to order in. 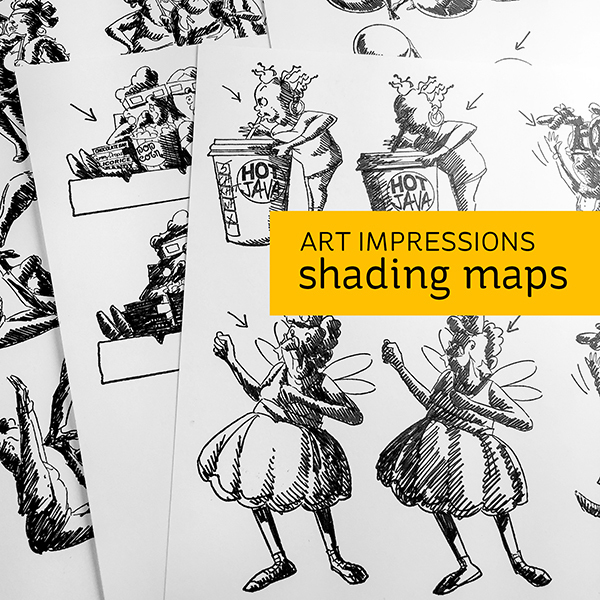 And if you missed the Clearly Besotted Shading maps last month, click HERE. For the next few days I’ll be hosting Periscope broadcasts to color more AI people. Hop on the app and join me! Links to download are on this page. And a bonus video for you, Periscope-related: during CHA I filmed the filming of a video – and at the end of this, you’ll see what the final video looked like! As a new cardmaker, I have been really discouraged by the lack of diverse images from popular stamping companies. I’d love to introduce my 5yo daughter to the art, but I want to have images that represent us! Thanks for showing an inclusive way that encourages multiethnic representation within this art form. Sandy, thank-you so much for all your hard work and doing the PDF’s and sharing. In addition to showing us your awesome coloring. I appreciate it and love all that you do…..fabulous! Thank you so much. You are very generous and I will be able to use all that you provided to us today. I learn so much from you. Thanks! Thank you. This is going to be very helpful. Thank you so much! You are incredibly generous! Wonderful card. Thank you for the freebies 0. Wonderful card! Love the coloring…just awesome! Thank you so much for your generosity. The shading maps are a wonderful idea! Thanks for the freebies and the video. Thanks for all your videos! 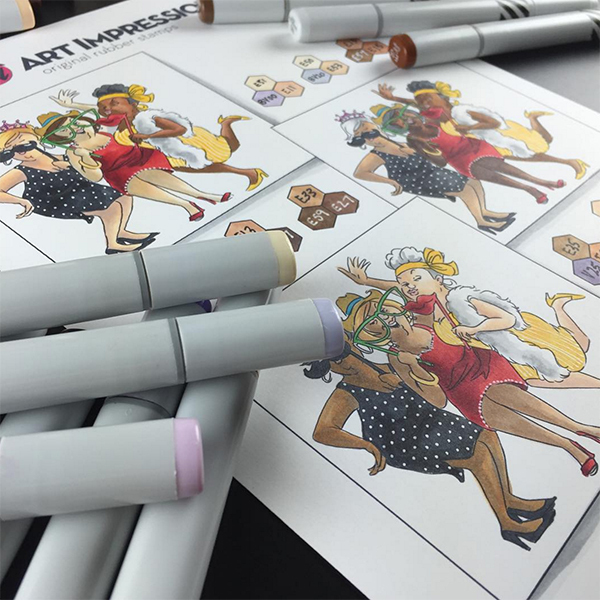 Love your coloring and promoting diversity in our cards! I love to watch your videos. You make coloring look so easy. I love how you added the patterns to the dresses. Very fun card! A great Copic tutorial Sandy. Thanks for sharing. thank you for all the freebies. Very much appreciated. Great post! Thanks for the freebies. Great video and card. Thanks for the freebies. Have a great weekend, Sandy. I never would have guessed to add BV to a skin tone to help create shadows. Love all the generous freebies. Thank you. THANK YOU SO MUCH!!!! The shading chart is amazing. Thank you so much for all this instruction in Copic coloring and the human rainbow! You are so generous with your time and talent. I cannot wait to make an easel card like this for a friend! AH-MAZING! Fantastic card! Thanks for all the Copic coloring information! Wow! It feels like Christmas with all the freebies today! Thank you for your generosity!